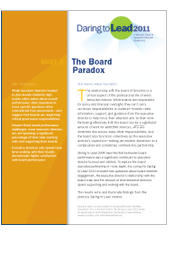 While executive directors tended to give boards relatively high marks when asked about overall performance, their responses to more speci­fic questions often contradicted that assessment—and suggest that boards are neglecting critical governance responsibilities. Despite these board performance challenges, most executive directors are not spending a signi­ficant percentage of their time working with and supporting their boards. Executive directors who spend more time working with their boards demonstrate higher satisfaction with board performance. Read more and download a PDF of Brief 3 either by clicking the button below or using the free alternate download via MediaFire.com. I recently retired after 30+ years as a nonprofit manager, most recently I ran a hospice but I’ve also worked with homeless families, domestic violence and did research on transportation for the disabled. I would be interested in working as an interim ED/CEO. Is anyone at the Management Center matching interim leaders with nonprofit organizatons? I would be interested in talking to you. Please reply to me at lata_p@nullhotmail.com. Where are you located, BTW? I would be happy to speak with you about this and see if I might be of assistance, please contact me at marlac@nullcompasspoint.org.